Mayweather/Pacquiao: Will It Ever Happen? The world is waiting for the most anticipated fight of our time, the clash of the titans in Floyd “Money” Mayweather the pound for pound king and Fighter of the Decade Manny “Pacman” Pacquiao”. But the question is, will it ever happen? Fans around the world hungers for a mega-fight that could well reinstate boxing back to its glory days more so if the two soon hall of fame boxers agree to its terms for the much awaited fight. Boxing’s popularity have declined in the past years while counterpart MMA’s popularity skyrocketed and is currently at its height. It can be recalled that Mayweather demanded Pacquiao to undergo series of drug testing for the fight to push through. The Filipino warrior nodded as long as the fight-purse is balanced. Of course, Money Mayweather did not agree with the idea. The American believes that he should get the much bigger share of the pie due to his clean boxing record status, meaning zero defeat. Bob Arum’s Top Rank right after a Mayweather or Pacquaio fights regularly pushes for the idea of a mega fight but as usual, reasons and excuses will always arise. Probably, the best offer came from Pacquiao himself when he challenged Mayweather into a winner take all fight and whoever wins all proceeds will be donated to the Filipino super typhoon victims. 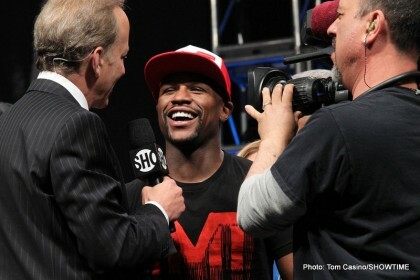 Up to this very day, there are no reactions from the Mayweather camp. For goodness sake gentlemen, this fight is the fight fans are dying to see. Give the fans that privilege of seeing one of the greatest fight in this lifetime. Boxing should not only be for the money but for the sake of providing pure entertainment. As for now, while terms and conditions are in the works, it is safe to say that the “Mayweather-Pacquiao bout is on” and that is on the verge of not happening ever, not unless they put aside the issue on who gets the bigger fight-purse. You are here: Home / Boxing News / Mayweather/Pacquiao: Will It Ever Happen?